Three bedroom Apartment is ideally situated in a brand new seafront resort 60 metres from the beach and close to Protaras center and all amenities, walking distance from the beautiful golden sand of Green Bay Protaras. This seafront Three bedroom Apartment consists of open plan kitchen, dining and living area which opens to a balcony, three good size bedrooms and 2 walk-in shower shower rooms. With comfortable double sofa bed in the living room, this apartment can easily accommodate 6 persons. Different types of lighting allow this apartment easily change its moods.The bedrooms are specious, one with two single beds (bunk bed) and the other 2 bedrooms with double beds. With comfortable double sofa bed in the living room, this apartment can easily accommodate one more adult or two small kids. All rooms have in built wardrobes and air conditioning. 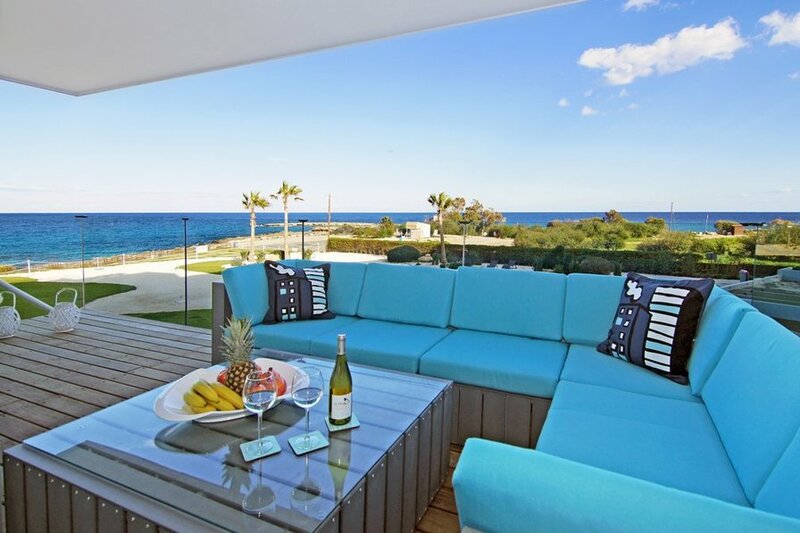 The living room is open-plan with panoramic sea view, dining and sitting areas, balcony and fully equipped kitchen. There are comfortable double sofa bed, satellite TV and DVD player. Fully equipped kitchen with fridge/freezer, cooker, microwave, toaster, kettle, washing machine, dishwasher, ironing facilities, oven, extractor fan and all cooking utensils. Apartment is air-conditioned throughout and has spectacular, unobstructed sea views from all rooms. This seafront Three bedroom Apartment can comfortably accommodate 6 adults. High speed internet connection available free of charge. All necessary bed linen and bath towels are provided free of charge in this beautiful apartment in Protaras. This lovely seafront apartment in Protaras is located in one of the most attractive resorts of Cyprus. A couple of minutes walk to the bars, excellent taverns and restaurants, supermarkets, bank, kiosks and car hire rental offices. Larnaca airport is about 40 minutes drive from the apartment. The Protaras coast is a the family friendly coastline resort with its famous white sandy beaches and, in particular Green Bay and Golden sands where you can find activities such as snorkelling, jet-skiing, para-sailing plus Water world, where children can splash all day.